After a college career in which he starred on offense as well as defense, Derby was chosen by the Los Angeles Rams in the fifth round of the 1957 NFL draft with the intention of utilizing his speed in the defensive backfield. After reporting to training camp significantly underweight, he was traded to the Steelers where he made an impact on defense. He picked off four passes in 1958. Steelers went 6-5-1 to finish fourth in the NFL Eastern Conference. Derby followed up with three interceptions in 1960 and was considered to be a sure tackler as well as effective in pass coverage. 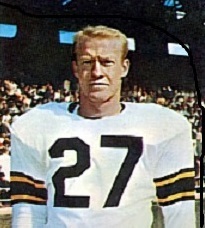 He struggled in 1961 and was waived and picked up by the expansion Minnesota Vikings. He spent one last NFL season with Minnesota in 1962. Overall, Derby intercepted 21 passes, 14 of them with Pittsburgh. His loutstanding 1959 season remained his best.